One of the best hurdlers of all time and a national hero, the appropriately named National Spirit was instrumental in establishing the Champion Hurdle as the prestigious and sought after prize that it is today. A dual winner of the race, his victories and subsequent rivalry with three-time winner Hatton’s Grace lit up the Cheltenham Festival in the early post-war era. Foaled in 1941, National Spirit was a son of Scottish Union, out of a Coronach mare called Cocktail and was bred by his owner Mr. L. A. Abelson. A big long-striding chestnut horse, he was originally called Avago before being renamed and put into training with Vic Smyth at Epsom. During his career, National Spirit was tried both over fences and hurdles as well as on the Flat, with varying degrees of success. He made little impact as a chaser, including running out at Nottingham and falling at Windsor. Switching back to novice hurdle races, it took two more runs for National Spirit to get his head in front, before he racked up a hat trick in the early summer of 1946. National Spirit returned in the autumn to record two easy victories, before heading straight to the Champion Hurdle Challenge Cup at Cheltenham (held this year in April). Moderately fancied at 7-1, National Spirit was up against the French favourite Le Paillon (who went on to win the Prix de l’Arc de Triomphe) and 1946 winner Distel. Trainer Vic Smythe had confidence in his horse’s ability: when questioned about his opponent’s chances, he’d replied “he’ll have to be pretty good to beat mine”. Given a canny ride by Danny Morgan, National Spirit hugged the inside and saw off the wide running Le Paillon by a length. The 1948 Festival saw National Spirit line up off a narrow defeat in the Trespasser Handicap Hurdle at Lingfield, when he conceded a stone in weight to Mieuxce and gone down by less than a length. Le Paillon wasn’t in the field, and National Spirit recorded an impressive two length win from D.U.K.W. under his trainer’s nephew Ron Smyth. Seemingly at the peak of his powers- he was rarely defeated in his prime- few could know that that was the last Champion Hurdle won by National Spirit. Unsighted behind him in eighth was a scrappy Irish gelding trained by the great Vincent O’Brien who would improve to win the next three renewals: Hatton’s Grace. Although a fast an accurate jumper, National Spirit had stamina in abundance and couldn’t match the speed of the Irish horse. The following season National Spirit won three of his four starts before the Festival, but appeared to run below form in the Champion Hurdle and finished fourth to Hatton’s Grace. In 1950 he filled the same position, but had been giving Hatton’s Grace a race before a mistake at the final flight halted his momentum. 1951 was heartbreaking for fans of the English horse, who was in the lead and looking sure to go close when falling at the last while Hatton’s Grace went on to win his third Champion Hurdle. Some commentators were sure he would have won had he stood up, as he was certain to battle on. National Spirit lined up one final time in 1952 as an eleven year old, and finally managed to finish ahead of his old rival. However, both veterans were unplaced behind the new champion and future three-time winner, Sir Ken. Away from Cheltenham, National Spirit was a regular at Fontwell where he recorded five wins including three renewals of the Rank Challenge Cup (1948- 50). He also won two renewals of both the Princess Elizabeth Handicap Hurdle at Sandown and the Milburn Hurdle. National Spirit’s final victory over hurdles was in the 1951 Bullcroft Hurdle at Doncaster, where he won by fifteen lengths giving the second Jigaway a stone in weight. National Spirit also ran in numerous staying handicaps on the Flat, winning the 1947 Cosmopolitan Cup and Croydon Stakes at Lingfield, and finishing fourth in the Northumberland Plate and fifth in the Ebor. In recognition of National Spirit’s achievements and record at Fontwell Park, the racecourse named a Grade Two hurdle race in his honour. 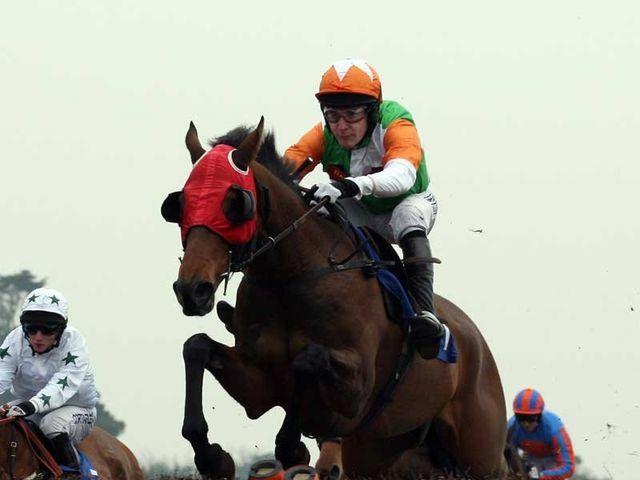 The race has been won by the likes of Comedy Of Errors, Baracouda and recently Lough Derg (twice). Although overshadowed by Hatton’s Grace and Sir Ken, National Spirit was without doubt one of the finest winners of the Champion Hurdle, and his role in increasing the popularity of the race and hurdlers in general should never be forgotten.